Geoff Develin loves his new 13,000L FloodRite Water Cart! Geoff Develin Engineering has recently won a contract on the Canberra Light Rail project, and part of the contract is on-site dust suppression and water cartage tank. 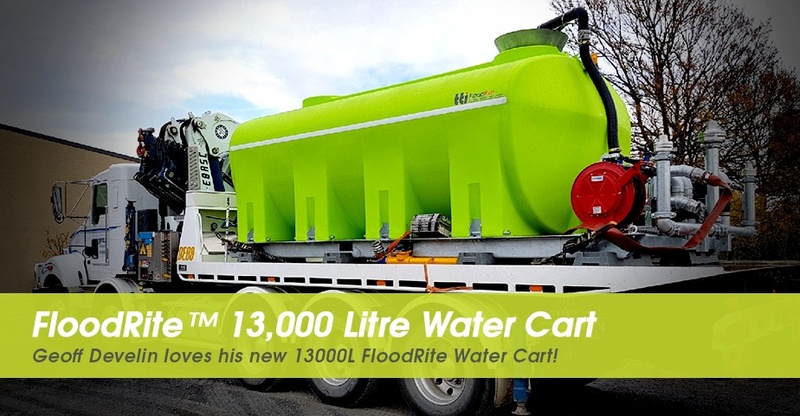 Check his new 13,000 Litre FloodRite™ that will do just that! Why a FloodRite™ Water Cart from TTi? Goeff Develin Engineering recently bought a 6000L TTI FloodRite™ water cart, and after a couple of months use on the Canberra Light Rail project, he has bought another FloodRite™ unit, this time the 13000L low profile unit! Geoff said he is ‘very pleased with the unit‘ and it ‘fitted up perfectly‘ to his impressive tilt tray truck. The slip on/slip off design means your truck can be turned into a dust suppression or water cartage unit in minutes. There is huge cost savings associated with having a slip on slip off unit rather than a dedicated water truck. It gives you the versatility to mount the FloodRite onto different trucks and immediately turn them into water carts, or use on the same truck but mount/dismount as you require. Individually controlled powerful spray heads means you can kill the dust fast, which is what you need on a high traffic job site. Easy to Use, With the Operator in Mind! Wireless controls as standard allows functions to be operated from the comfort of the truck cab. This means Geoff can entirely operate the FloodRite™ whilst driving the truck, getting the job done faster and saving him time and money. Standard of the features include 3 x high volume spray heads, Yanmar diesel motor and a hose reel for washdown etc.The Australian Made polyethylene tank has been extensively tried and tested for many years, and proven itself as a more reliable, versatile and long lasting option than traditional steel cartage tanks. For custom build, please send your enquiry here or get a quote and one of our industrial tank specialist will get back to you shortly. Get your FloodRite™ today. Call 1800 816 277 to speak with one of our experienced and passionate consultants!